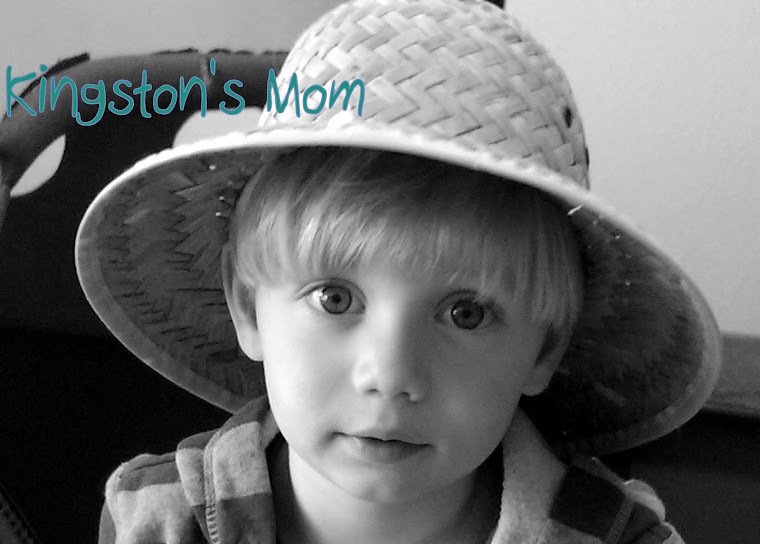 Kingston's Mom: STELLAN NEEDS YOUR PRAYERS! Attention all blog readers! As you know, I am slightly terribly obsessed with MckMama and her family. And right now, Stellan is being airlifted to Boston for treatment on his poor, tired heart. He needs all of the prayers and thoughts you can offer him, as do his family and especially his doctors. Pray for wisdom, patience, healing, and peace. As for us, Kingston is feeling fine if not a little, or a lot, overtired and not napping. I'm fine, if not a little, or a lot, lazy and not cleaning my dirty house. And Nigel is laid up in the bed with major lower back muscle spasms. He is in a ton of pain and is being a total pain like all men do when they have an injury or illness being a total trooper. Looks like thunder storms for this afternoon and it is hot as blazes. It will be a miracle if we survive this afternoon together in this house. Just kidding. We will survive. And we would like for Stellan to survive so we will pass that mirale on to him. Get better, buddy! We're all praying! Stellan will certainly be in my prayers...as will the Haynes family. Hope Nigel is feeling much better soon. Call on Grandpa if you need anything. He is available and willing! Before You Ask. . .